TFOT 12-16-15 Lynne Taylor discusses NCLB / ESEA / ESSA passage and its impact. Mackenzie Dreeszen’s parents had obviously prepared her well for life. Mackenzie not only managed to survive or maybe even miss the dormitory debauchery and binge drinking that destroys so many while on campus, but she was one of a shrinking number of college graduates who quickly found a job and started her career. In the short time since graduation she has started her own business, is a productive member of society, and making a difference. Which might be part of the problem. Some simply don’t like the difference she’s making. Apparently, after making it through without the scars of a liberal, leftist, society that are all too embedded on many of our campuses today; those who demand control of public dialogue are determined to extend their tentacles of intolerance past the clutches of a campus to expel dissidents (free thinkers in this case) right out of their little communes. Though more subtle, the course of action often looks like this: Assimilate – or – we will humiliate -> intimidate -> isolate -> confiscate and finally eradicate. Which is pretty much what Cornell College‘s Delta Phi Delta Triumvirate 2015/16 has attempted to do without any notice or recourse offered to Mackenzie. What was Mackenzie’s offense? 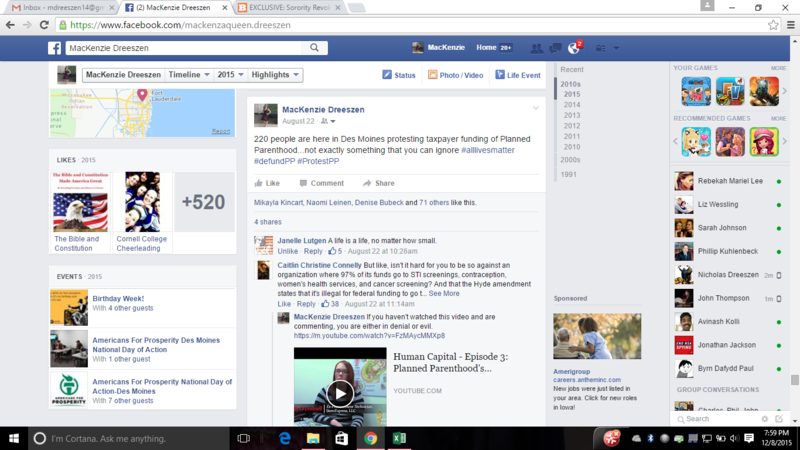 In August 2015, she attended a rally to protest taxpayer funding of Planned Parenthood and had the audacity to post it on Facebook with the following text. Being told later that the phrase of #AllLivesMatter was racist – you can see what Mackenzie was up against, right? Inclusive words like all are now racist? Cornell College and President Jonathan Brandt has refused to intervene. Interestedly, the college Facebook page has allowed some very ugly attacks toward FB users who posted comments questioning a campus event on “Islamophobia” that should concern any parent considering the cost (financial and otherwise) of sending their student to college. Listen/watch the ongoing story in the Truth Four Our Time interview above. See this petite young lady who is thankfully not allowing the attacks of others to go unanswered. Her bravery is to be commended. Since sharing her troubles, many others have shared similar stories with her. If you have a story like hers, let us know at info@TamaraScott.com. In America, we have long enjoyed and praised the fact that anyone could work hard and pursue the American Dream choosing whatever career path they desired no matter their parents income, vocation, education level, or ethnic background. Those dreams could be fading for many with America’s new CASTE system coming in through the educational system. Today’s guest, Lynne M. Taylor, @CommonCoreDiva, warns of the education tracks that will limit children beginning in preschool. Programs like STEM (Science Technology Engineering Math) CTE (Career Tech Education) and CCSS (Common Core State Standards – [though it is an unconstitutional federalized program]) all sound promising, but will undermine the creativity, freedom, and worth of children while limiting their options later on. It’s not just children at risk, Lynne warns these programs will impact adults going back for graduate, masters, and doctoral programs. In her blogpost titled FTF: Measure Twice, Cut Once Lynne shares of the new cookie cutter workforce being developed through public-private partnerships between corporate America and the education industry. With all the acronyms and terms used to keep taxpayers and parents guessing, Lynne gives us some key phrases to watch for in state legislation. Though not limited to these, some buzzwords/key phrases causing concern could be: “unified plan” “education and workforce” “one stop job centers” and “WQDI – workforce quality development initiative” (which coupled with the SLDS – state longitudinal data survey will provide incredibly private, sensitive, non-academic, personal information about your family (not just the student) that someone can then use to place your child in the career path they deem appropriate. Would you want your child limited by your mistakes, education level, or skill set? What concerns me about all of this is that some parents who may have been uncertain of their own career field, maybe changed career paths, or aren’t yet happy in their current career/vocation will think the lack of clarity they’ve experienced could be alleviated for their child. Like some process will somehow create a mystical formula and magically place students in the perfect career slot. It could happen, but NOT through these programs and certainly not by some stranger deciding what workforce/industry demands need to be filled and who might best suit that need. The fact that many with degrees are not working in the area of their study or many have totally changed fields could be due to wrong direction – these programs will likely bring more of that, not less – especially when tied to corporate world incentives. Changing careers can depend as much on personal revelations and seasons as anything else and these ‘scientific’ formulas will not take such criteria into account. Instead, it will complicate it if folks are pigeonholed and not able to access study programs, internships, and apprenticeships of their choosing; but someone else’s selecting. No adult, nor parent should think that because they experienced confusion in their college to career path that some government program will stop others from the same. Any number of college grads or drop outs who changed majors or feel their college advisors failed them should understand the concern with these programs. Isaiah 30:21 Your own ears will hear Him. Right behind you a voice will say, “This is the way you should go,” whether it be to the right or to the left. The Creator, who uniquely designed you to be who you are, has also gifted you to fulfill the plan He has set before you. When we move in that plan, life hums and we’re a buzz with delight and productivity. When we’re out of that plan, our only buzz seems to be one buzz saw after another. So maybe we don’t need more government programs for workforce development or educational tracks. In fact, it is likely the secular indoctrination taking place in these PreK – College programs that alienates the individual from the One who gave them the gifts they’ll most enjoy using in a vocation. Beyond the outright hostility toward Christianity, it is the busyness and hectic schedules forced upon families and students by these schools and colleges that often cause individuals to skip their quiet time in prayer and reflection that can clear the mind, heal the soul, allow peace, and bring answers. Even worse, while 60% of Americans say they want to the read the Bible, as high as 26% of adults say they don’t read read the Bible. When we’ve finally exhausted the vast number of experiments and expensive, non-productive governmental/educational programs that have failed to improve reading, test scores, or prepare adults to enter the work force – maybe, just maybe, we’ll return to the wisdom of the 1642 Old Deluder Satan Act and educational honesty that gave America her great leaders who would lead the world by setting this country on the course of success and accomplishment.